It was the Giants vs. the Dodgers (ew) last Tuesday night. I’m not going to say who won because, again, ew. Who won isn’t important anyway. 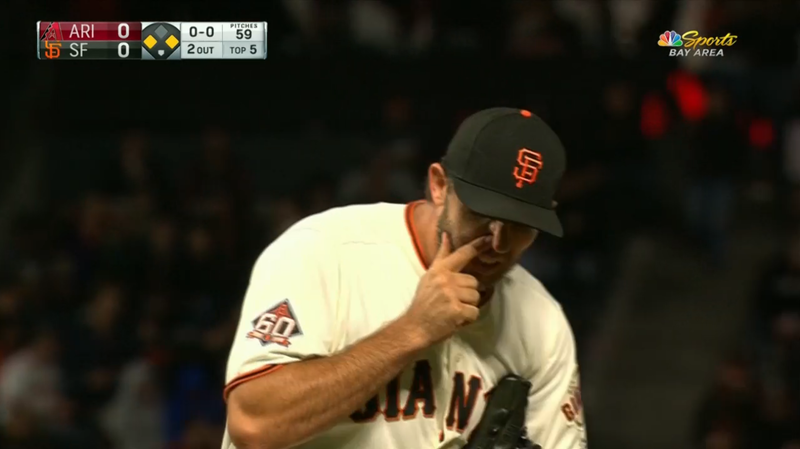 What is important: Bumgarner snotrockets. L, 6.0 IP, 5 H, 5 R, 0 ER, 2 BB, 4 K,1 HR, 7 SNR (snotrockets): 3 vs. lefties, 3 vs. righties, 1 other. 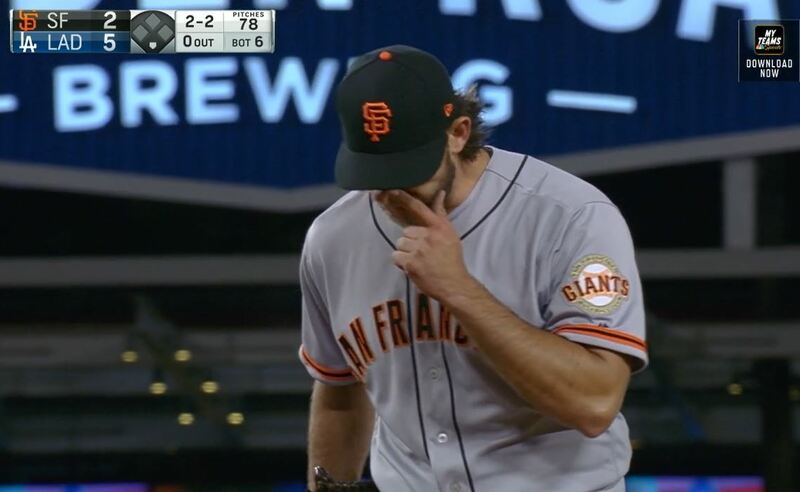 Madison Bumgarner now with 21 snotrockets in the 2019 season. When the truth was, I should have never sacrificed watching a Bumgarner start live over zombies. Only one other time have I done this and the guilt was such that I swore I would never do it again. 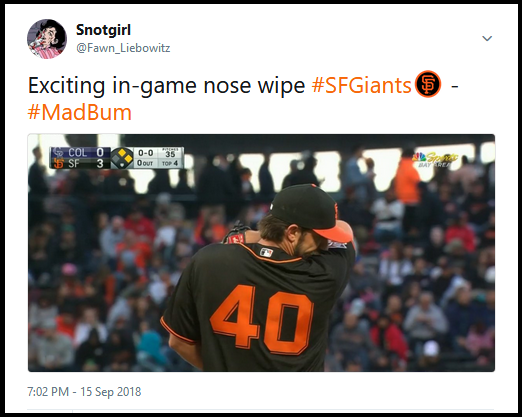 Last Tuesday I did it again and I’m firmly convinced that because I broke my promise and betrayed Bumgarner and his snotrockets he and the Giants lost the game. I must live with this guilt forever. Bumgarner’s home run made it a 5-2 game; after that the Giants got closer, scoring 3 more runs in the 9th but ultimately lost to the Dodgers (ew) 6-5. So the good guys lost but the snotrocket fans won. 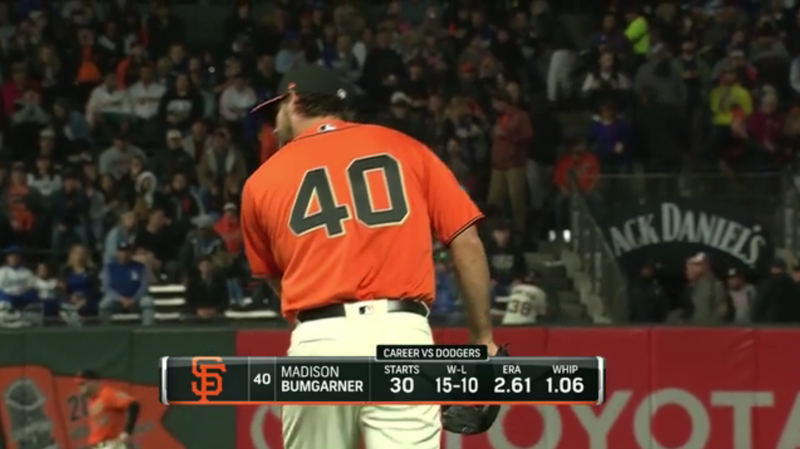 Madison Bumgarner’s next start after this one was Monday, April 8th, 2019 at home vs. the San Diego Padres. 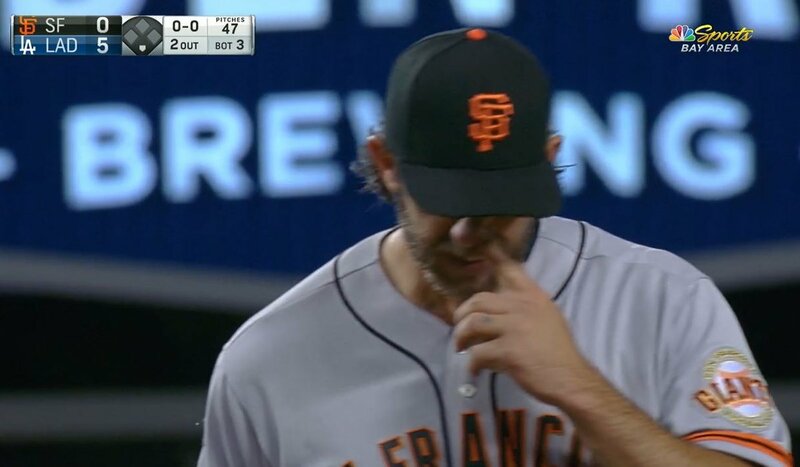 Tune in here soon for that thrilling episode in the Amazing Adventures of Madison Bumgarner’s Snotrockets. In the meantime you can catch me on Twitter, talking about the Giants, Bumgarner, The Walking Dead and who knows what else. 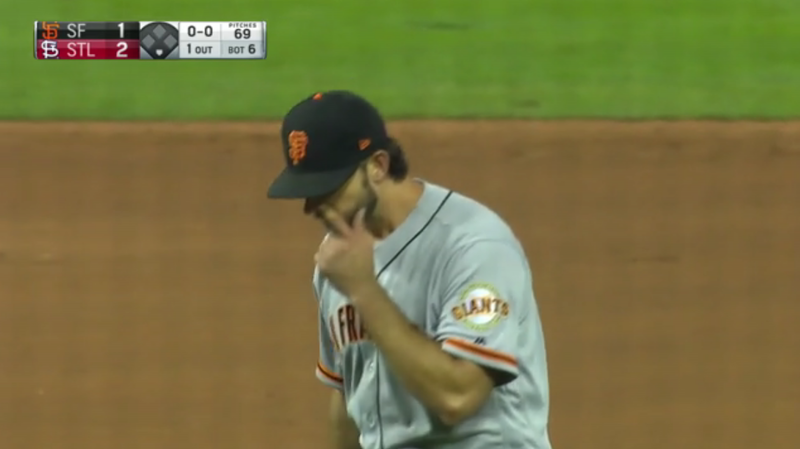 Thanks for stopping by and see you back here for all the exciting Bumgarner snotrocket action. 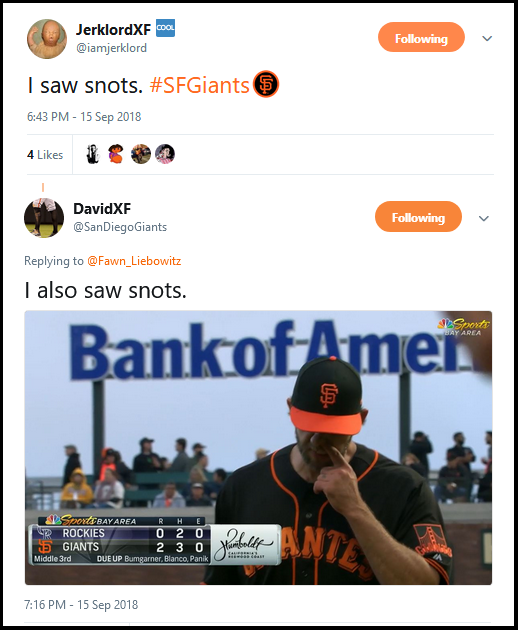 Even before his injury-shortened seasons of 2017 and 2018 Madison Bumgarner was blowing fewer snotrockets since his season high of 393 in 2014. Who or what to blame for the loss of mucus? 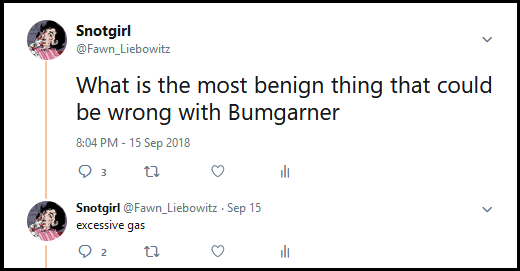 Only Bumgarner knows for sure. The mystery continues. 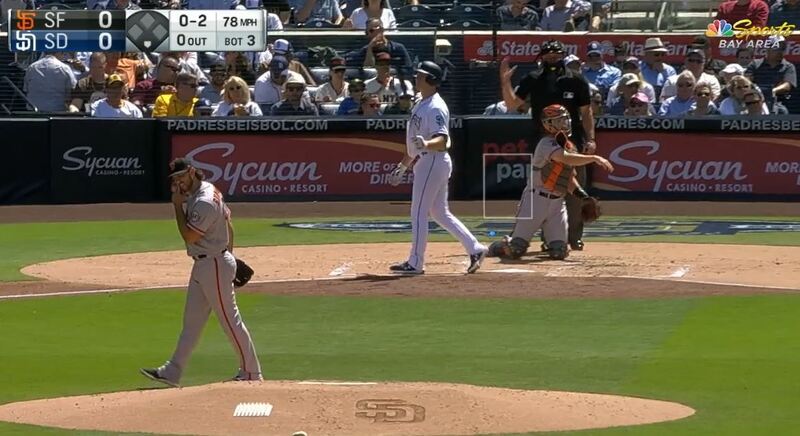 Fewer Bumgarner snotrockets are bad. It makes us sad. I have good news however. THE MUCUS HAS MADE A COMEBACK. 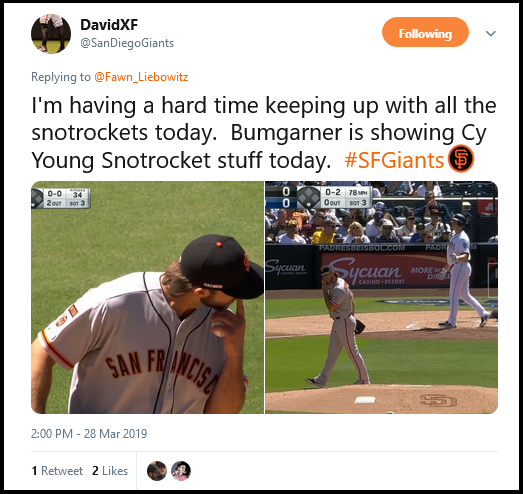 Bumgarner was the Opening Day pitcher for the San Francisco Giants and even though once again he received no run support and another undeserved loss (sigh) the snotrockets were full and lush and plentiful. Oh for joy we have been blessed. L, 7.0 IP, 5 H, 2 R, 2 ER, 1BB, 9 K, 1 HR, 14 SNR (snotrockets): 1 vs. lefties, 7 vs. righties, 6 other. 4 double SNR. 1 double blow SNR. 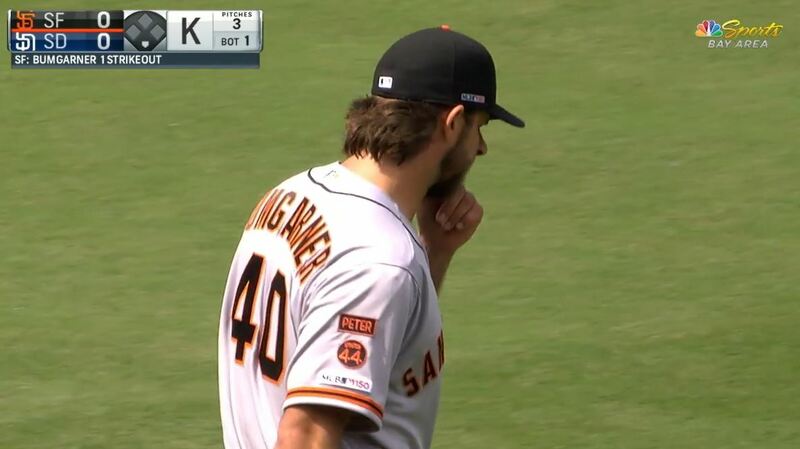 Madison Bumgarner’s most prolific inning was the 1st in which he blew 5 snotrockets. 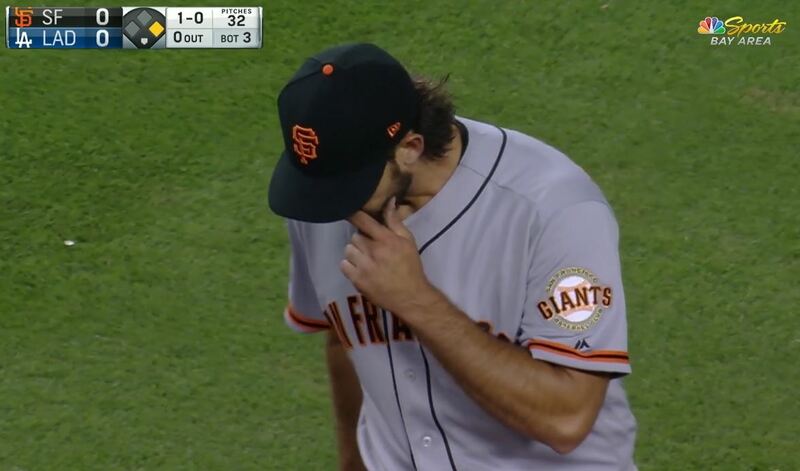 Madison Bumgarner with 14 snotrockets in the 2019 season. Madison Bumgarner’s next start should be Tuesday, April 2, 2019 on the road vs. the Los Angeles Dodgers (ew). See you here or and on Twitter for all the exciting Bumgarner snotrocket action. 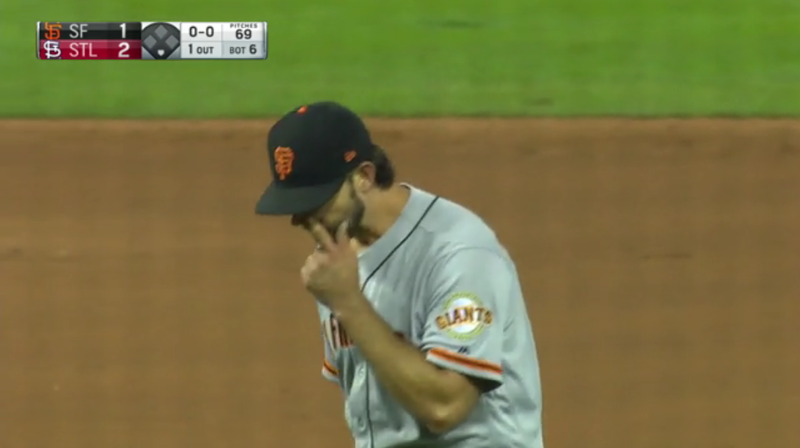 Here endeth the 2018 Bumgarner snotrocket season. It was short but sweet. 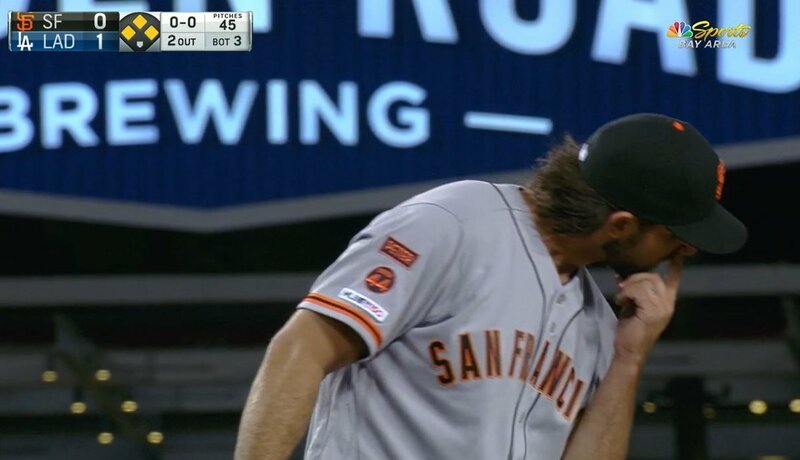 Let’s hope that 2019 brings with it a healthy Madison Bumgarner and a full season of his snotrocket magnificence. Thank you to everyone who subscribes to this blog and also to anyone who may have just stopped by to pay a visit. I appreciate you all. See you here in a few weeks for that exciting post. 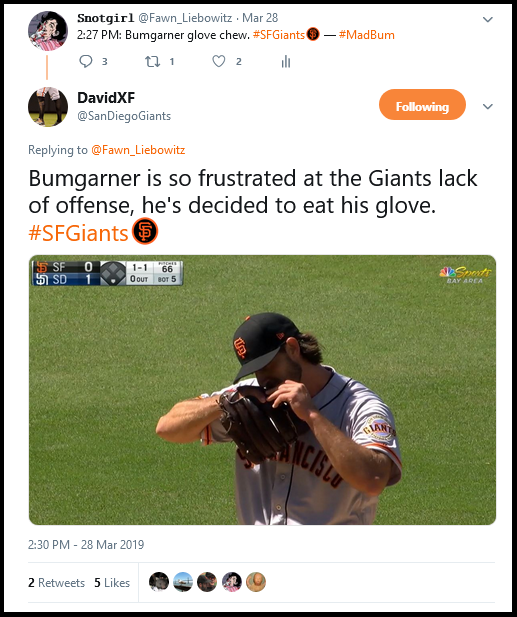 In the meantime you can always find me on Twitter, talking about Bumgarner, his snotrockets and anything else I can think of. Happy New Snotrocket Year! Not much of a game. Not many snotrockets. 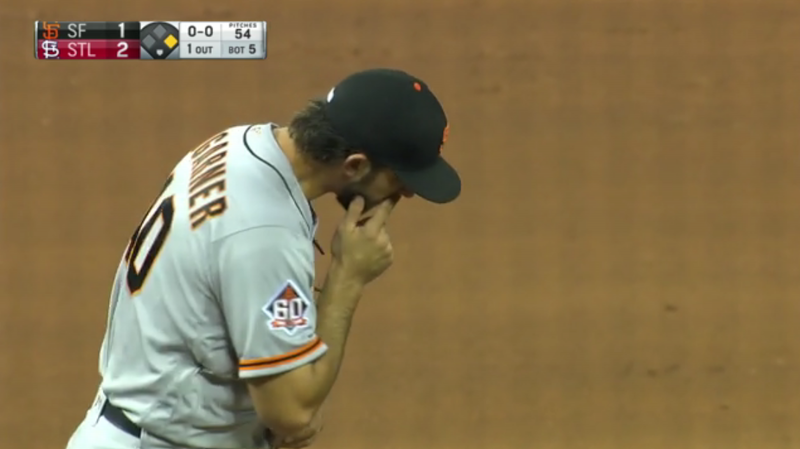 Not a great way to end the season for both Madison Bumgarner and the San Francisco Giants. L, 6.0 IP, 7 H, 3 R, 3 ER, 1 BB, 6 K, 1 HR, 1 SNR (snotrockets): 0 vs. lefties, 0 vs. righties, 1 other. 1 pre-game SNR. 1 double SNR. 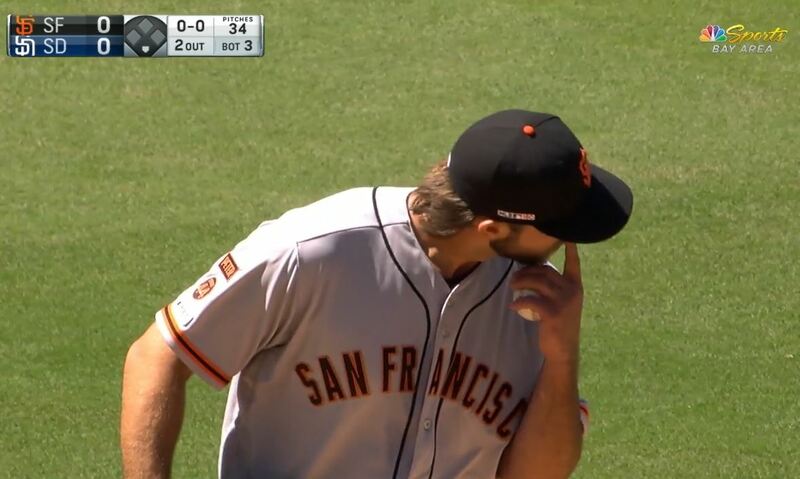 Madison Bumgarner’s most prolific inning was the 1st in which he blew 1 snotrocket. Madison Bumgarner finishes the 2018 season with 82 snotrockets. 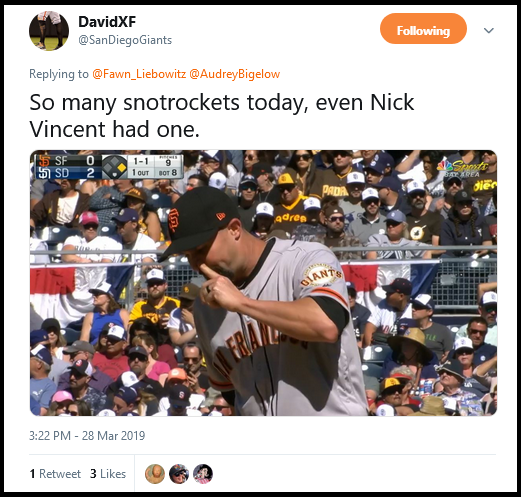 My next blog post will be Bumgarner’s season snotrocket totals. 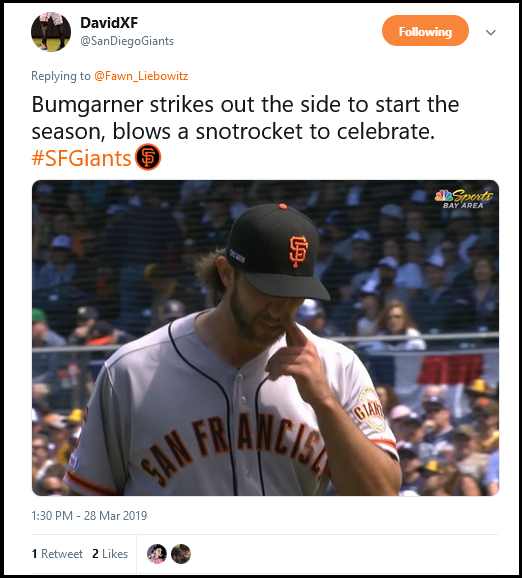 I have been procrastinating for most of the off-season but I am determined to get these snotrocket stats published before the end of the year so help me Bumgarner. So watch this blog or better yet subscribe to it using the link button on the right (at the bottom for you mobile users) and you’ll be able to stay informed with up-to-the-minute snotrocket facts. You can always follow me on Twitter too for more snotrockety goodness. Unless I write these blog posts immediately after the game is over then a good portion of said game is forgotten in my mind. That’s happened often in 2018 but my memory can’t be entirely to blame. A lot of that has been because the San Francisco Giants have had so many bland, lackluster games this season that they all seem to blend into one another. Instead of individual outings you just have big lumps of games, with few notable things sticking out of the lumps like a rare Giant home run or, of course, the snotrockets. ND, 6.0 IP, 8 H, 3 R, 3 ER, 1 BB, 5 K, 4 SNR (snotrockets): 0 vs. lefties, 2 vs. righties, 2 other. 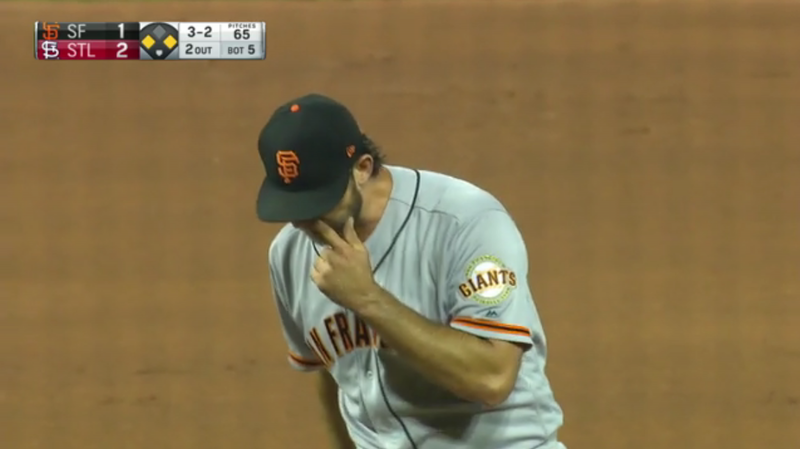 Madison Bumgarner’s most prolific inning was the 5th in which he blew 2 snotrockets. Bumgarner now with 81 snotrockets in the 2018 season. 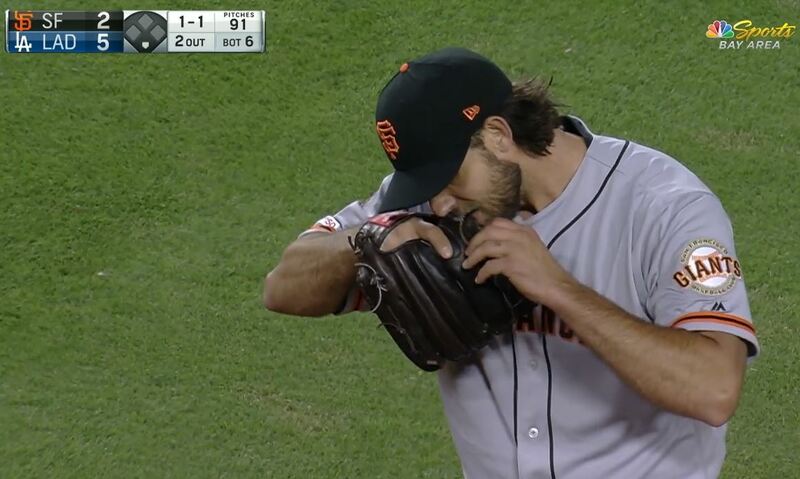 Bumgarner’s last snotrocket of the night was an especially tricky one to catch. He was in motion while snotrocketing so every time I tried to get a nice clear screencap all I got was some snotrocket fuzziness. I finally narrowed it down to two different screencaps but it’s like when you’re getting an eye exam and the optometrist puts a couple of lenses in front of your eyes and says “Better one? Or two? One? Or two?” I NEVER KNOW WHAT TO SAY BECAUSE THEY ALWAYS LOOK THE SAME. So now it’s your turn. See? Not so easy is it? I should take these two screencaps with me to my next appointment and give the optometrist my version of an eye exam. “Better snotrocket one? Or snotrocket two? One? Two? Hmmm? ?” Take that, Dr. Well-I-Guess-They’re-Pretty-Much-The-Same-Huh. Madison Bumgarner’s next start should be tomorrow night, Friday, September 28, 2018 at home vs. the Los Angeles Dodgers (ew). Bumgarner and his Giants have a golden orange opportunity this weekend to spoil the Dodgers chances of reaching the postseason. How sweet would that be, to deny the Dodgers? As sweet as a brown sugar pie topped with a brown sugar crust and served with brown sugar ice cream. That sweet. I will be live tweeting tomorrow night’s snotrockets so come join me on Twitter or as always you can come back here for all the exciting snotrocket action. Beat LA! Rocky Snotrockets sounds like the name of a snot-blowing cartoon character. 10/10 would watch. Hey guess what? The San Francisco Giants won! Madison Bumgarner won! The fans won because there were snotrockets! Totals: W, 6.0 IP, 5 H, 0 R, 0 ER, 1 BB, 2 K, 7 SNR (snotrockets): 0 vs. lefties, 4 vs. righties, 3 other. 2 double SNR. 1 at-bat SNR. 1 mound visit SNR. 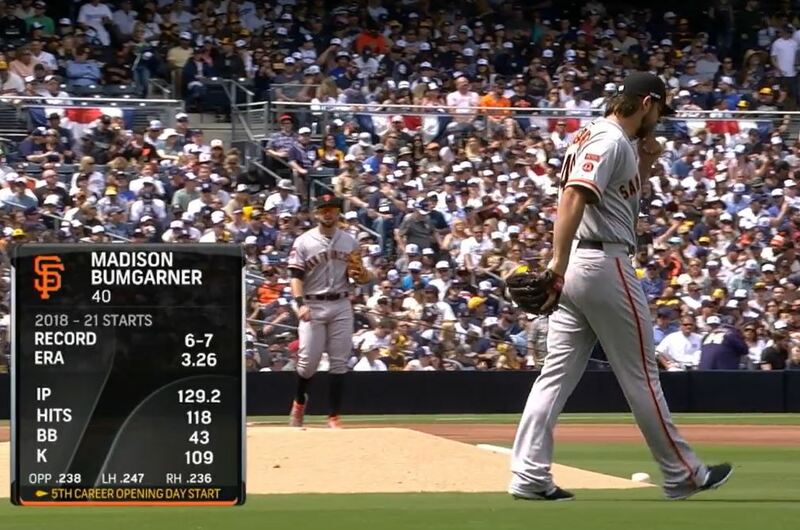 Madison Bumgarner’s most prolific innings were the 4th and 5th in which he blew 2 snotrockets per inning. Bumgarner now with 77 snotrockets in the 2018 season. 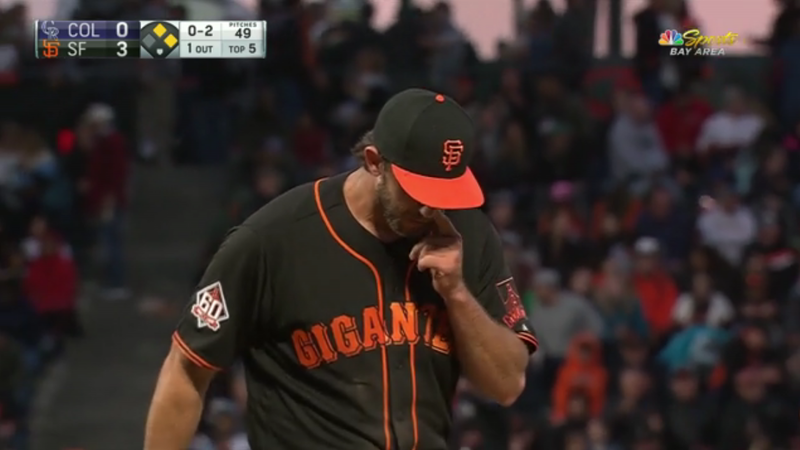 As it turns out Bumgarner felt a little side tightness during his last at-bat and was removed from the game for precautionary reasons so it was nothing too serious. Phew. Madison Bumgarner’s next start should be this Friday, September 21, 2018 on the road vs. the St. Louis Cardinals. See you here or on Twitter for all the exciting Bumgarner snotrocket action.